David Meldrum presented a paper on the SST aspects of FRM4STS to the EUMETSAT conference in Rome on 2 October 2017. The presentation; Towards improved drifter SST – A collaboration between the satellite community and the Data Buoy Co-operation Panel is now available under Presentations on our Project Documents page. A poster of the same topic is also available under Posters on our Project Documents page. 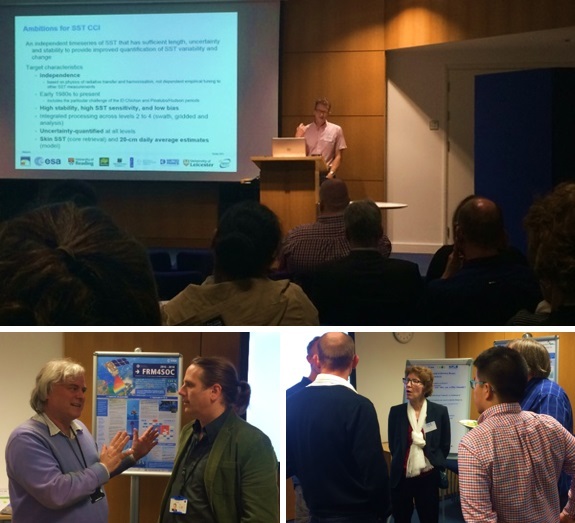 The SST-Drift 2017 workshop will review progress since the workshop on traceability of drifter SST measurements held in October 2016 and reach consensus on the way forward for drifter SST measurements and the establishment of best practice for the community. Help develop best practice for future drifter SST by registering your interest – contact David Meldrum davidmeldrumltd@gmail.com. A draft agenda can be found here. A new poster; Towards Improved Drifter SST: A Collaboration between the Satellite Community and the Data Buoy Co-Operation Panel by David Meldrum, Jon Turton, Gary Corlett, Craig Donlon and Anne O’Carroll is now available to download. From the 16 – 18 October, NPL are hosting the FRM4STS International Workshop. FRM4STS is an ESA funded project, to establish and maintain SI traceability of global Fiducial Reference Measurements (FRM) for satellite derived surface temperature product validation. The project will facilitate international harmonisation and interoperability through organisation of a set of inter comparisons under the Committee on Earth Observation Satellites (CEOS) and its Working Group on Calibration and Validation (WGCV). (Top) Chris Merchant of the University of Reading presenting Satellite-Based Sea Surface Temperature Climate Data Records. (Bottom) Delegates come together in breakout sessions to discuss and work towards an FRM4STS Roadmap. The FRM4STS International Workshop is now underway – if you are unable to attend the workshop, please visit the Workshop page where you can find many of the presentations. For further details, please visit the International Workshop page. 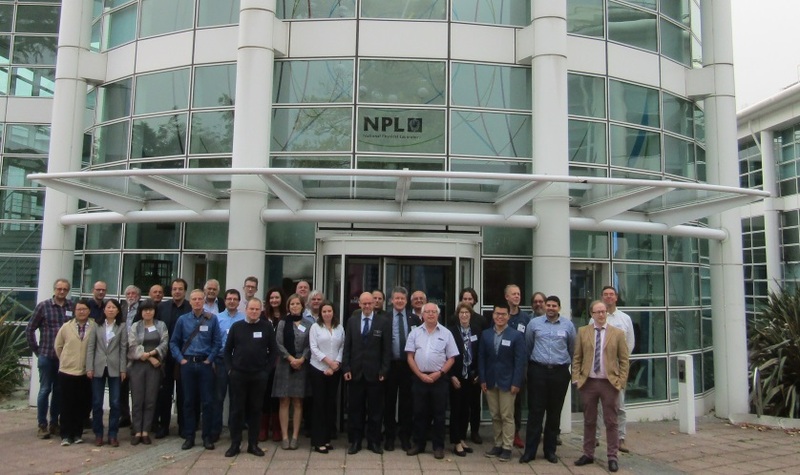 Dr Andrew Banks – Senior Research Scientist at NPL will be speaking about the FRM4STS project at the The Copernicus Sentinel Atlantic Meridional Transect Fiducial Reference Measurements workshop in June. 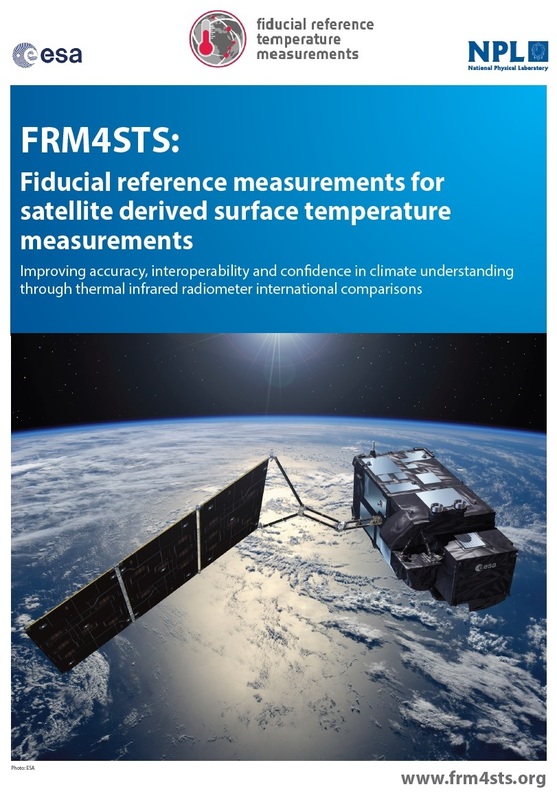 The FRM4STS Project has produced a brochure regarding its work to establish and maintain SI traceability of global Fiducial Reference Measurements (FRM) for satellite-derived surface temperature product validation. Please visit FRM4STS: Improving accuracy, interoperability and confidence in climate understanding through thermal infrared radiometer international comparisons – for a copy. For other papers and presentations, please visit the Project Documents page. Jacob Høyer (DMI) and Werenfrid Wimmer (University of Southampton) have provided details regarding a successful field inter-comparison experiment over sea ice that was conducted in March-April 2016 on the sea ice off Qaanaaq, in Northwest Greenland. 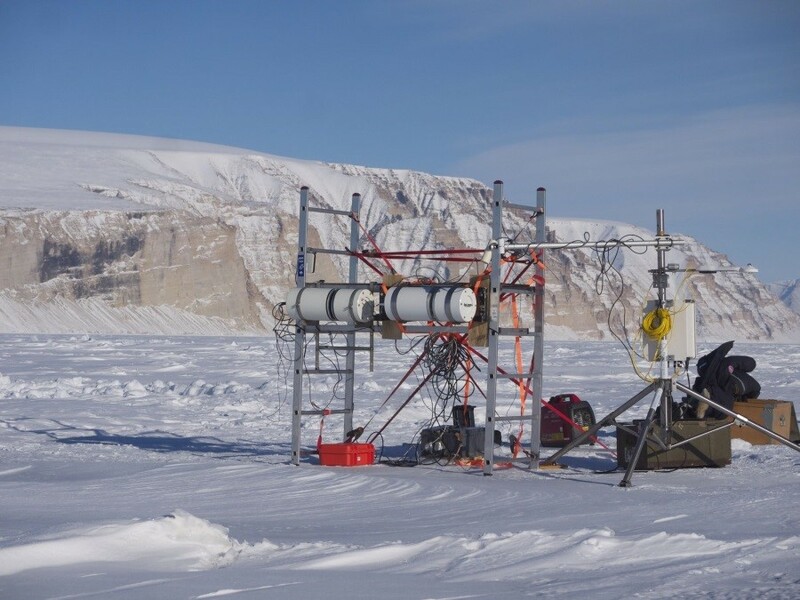 The site is well suited for conducting a field campaign on the sea ice and for measuring the ice surface temperature with radiometers. It is well within the high Arctic at 77oN with a dry Arctic atmosphere and cold temperatures in April. For further detail on the field inter-comparison experiment, please visit: Phase 2C: Ice Surface Temperature, Greenland. A report by David Meldrum on the meeting hosted at Scripps on 13-14 October 2016 under the auspices of the ESA FRM4STS initiative can now be found here: A scientific and technical workshop on traceability of drifter SST measurements, and also at our Project Documents page in the Meetings section. 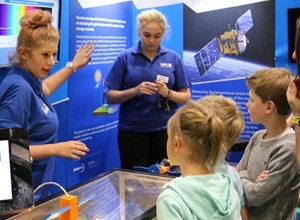 NPL featured a unique demonstration of satellite technology at New Scientist Live, a large festival of science held between 22 and 25 September featuring exhibits, talks and demonstrations on a range of different subjects including FRM4STS. NPL’s stand featured a miniaturised 3D-printed satellite model that contained a spectrometer. Visitors could move the spectrometer between a range of materials that mimicked different types of landscapes, such as vegetation, bare soil, sand and inorganic material (plastic grass). 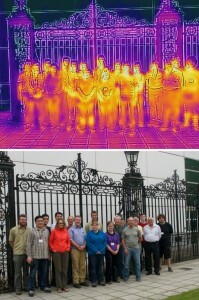 Additionally, the stand featured a demonstration of a thermal imaging camera. Our exhibit and activities at New Scientist Live was developed through the Metrology for Earth Observation and Climate project, which is part of the European Metrology Research Programme (EMRP). Also led by NPL, this project aims to develop new calibration methods for Earth observation satellites and to enhance the accuracy of their measurements. From the 7-9 March next year, NPL will be hosting the FRM4STS Workshop. Further detail to be made available shortly. Could all the participants of the recent FRM4STS exercise, please ensure they submit their comparison data by Monday 15th August 2016. From the 24 June to 8 July, NPL hosted the Infrared radiometer and blackbody intercomparison. On April 28th at 07:00 and 15:00 GMT there will be a 1 hr Webinar to present an overview of the forthcoming FRM4STS (Laboratory and Field comparison activities) for instrumentation used to measure surface IR Brightness Temperature of Land, Ocean and Ice.